Visitor Numbers Up, Sales Up, Industry Looking Up! Visitor numbers in total were up 1.6%, coming in at 37,094 over the four days. But importantly, out in force were genuine buyers. Organisers of this year’s event are ecstatic with feedback from exhibitors, all of whom state they are very happy and in many cases “blown away” by their results. John Hogan, CEO at Superior Jetties labelled this year’s event “the best we’ve ever done”. “Dollars don’t lie,” said one veteran exhibitor, thrilled that he had doubled his target for this year’s show, hitting a 24-year record cash and card total. Josh Metz, dealership director at Fairline Queensland said the show was “extremely successful” for the UK brand. Peter Collins from Arvor Boats said interest in the Weekender was non-stop and the leads were top quality. Riviera Syndication’s John Russell said this year’s show was “much better than last year”. Florian Caroller from Ensign Boat Brokers said the company went “better than expected”. Russell Wright at Horizon Motor Yachts Australia is “delighted” with results. “We were extremely happy with the numbers we had on our stand. It surpassed what we had expected. Whilst there were no direct impulse sales we were introduced to many potential buyers and progressed many of our current leads closer to a sale. It was also encouraging that fewer people were commenting on the current difficult economic times. Marc Hall from United Motor Yachts admits that they were late to sign up as exhibitors, and that while the Superyacht Pavilion was quiet for them, “the leads were strong”. 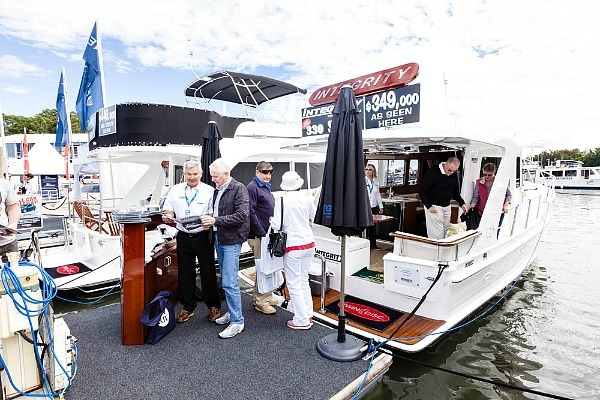 Mark Elkington from Multihull Solutions referred to SCIBS as “the best multihull show in Australia” and that this year’s event was “excellent for sales and leads”.